Organic based lawn fertiliser - indirect action against moss and no raking of treated moss. Slow release technology. Child and pet safe. 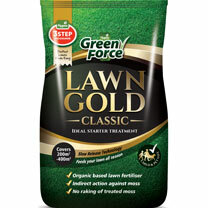 Feeds your lawn all season. Use from March to July. Available in two sizes: 10kg treats up to 200 metres square or 20kg treats up to 400 metres square.